What better way to end a busy week than with cake? Yesterday Harriet and I ventured to Podium Restaurant in the Hilton on Park Lane for a glass of fizz and Anthony Marshall's 'Confessions of a Chocoholic' Afternoon Tea. When I say 'ventured' I mean walking through what felt like the Hurricane level winds we'd experienced during our time in NYC with Hurricane Sandy. I'd purchased a Travel Zoo voucher and booked months ago, without realising I'd booked for Mother's Day! With 'Mumma Loves Food' away sunning herself in Dubai and Harriet's mum kindly excusing her for the afternoon we enjoyed a Mother's Day version of the 'Confessions of a Chocoholic' Afternoon Tea. Upon arrival we were presented with a tea menu and some samples for a quick 'sniff' of their favourite blends. We opted for Earl Grey with lavender flowers which was the perfect fresh blend to accompany the sugar overload that was to follow. Shortly after a glass of fizz and our sandwiches arrived. I went for the vegetarian sandwich option which included: asparagus, parmesan and balsamic vinegar; cucumber, cream cheese and chives; egg and cress; tomato, mozzarella and pesto; emmental cheese and grapes (walnuts as listed on the menu were missing). I wouldn't say that they were some of the best sandwiches I've had, but all perfectly fresh and a good selection of flavours. The next course, the start of the three-tiered 'stand of sugar', was mini chocolate chip scones served with a chocolate praline spread, clotted cream and homemade strawberry jam. Harriet enjoyed the strawberry jam and chocolate spread as a combo on her scone. I enjoyed chocolate, chocolate and a little more chocolate! Next up, a raspberry and lemon cupcake topped with heart-shaped shortbread. The cupcake was filled with raspberry jam and has inspired me to try something like this myself...watch this space! I felt that the lemon buttercream was a little too on the sweet side and not enough lemon. The cupcake was beautifully decorated with glitter, pearls, white chocolate, raspberry and the heart. For the final course we enjoyed a selection of delicate miniature fancies. 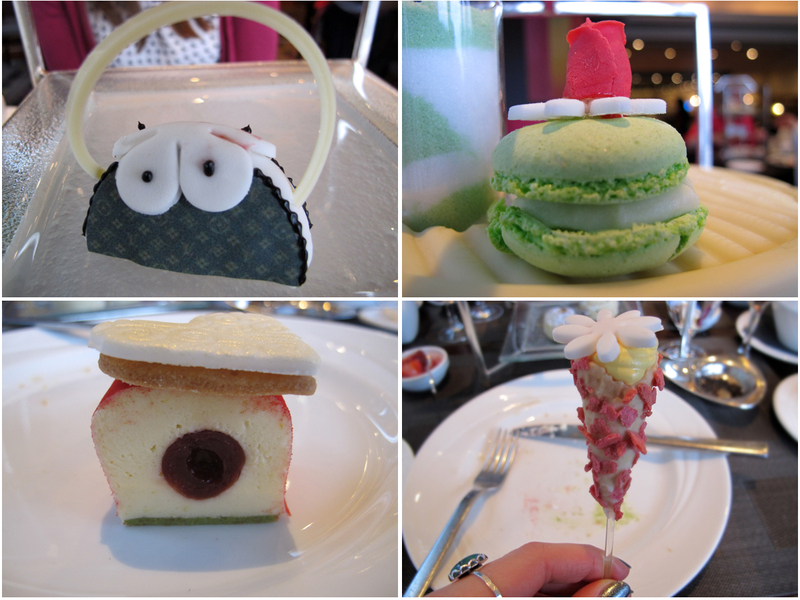 These included a Louis Vuitton Victoria Sponge handbag; pistachio macaron, white chocolate and cherry cheesecake topped with a heart-shaped shortbread; lemon and raspberry marshmallow cone; a dress-shaped iced shortbread (which got eaten too quickly for its close-up). 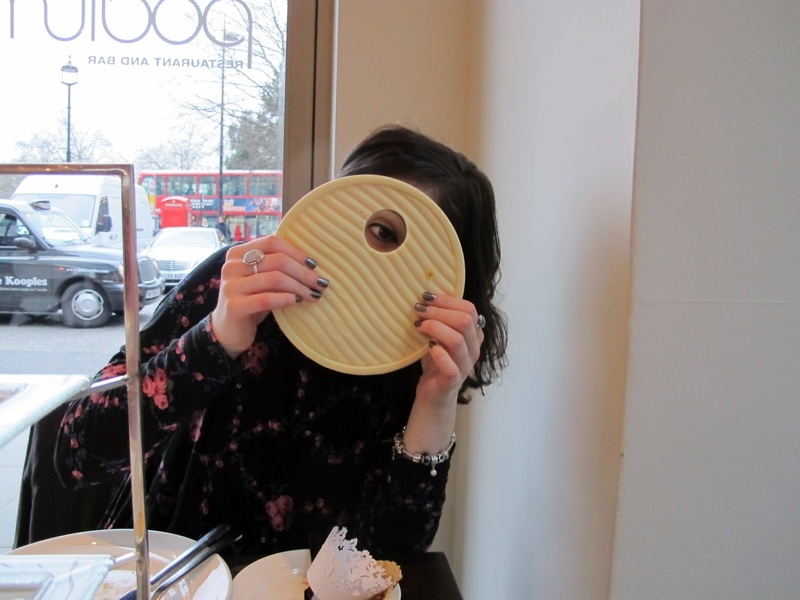 Which leads me to the final discovery, the entire top tier of the cake stand was in fact a white chocolate plate! Which they kindly boxed for us to bring home. I've yet to tuck into my chocolate plate as it's pretty hefty. This Afternoon Tea was girlie in every way and so beautifully presented. I can proudly say that the two of us cleared each cake and crumb, unlike the other diners surrounding us who seemed to fill their boxes for home with the entire miniature fancy course. Who doesn't eat cake, especially when one is taking tea? This looks like complete sugar overload for me! But the colours are so cute :) And that chocolate plate? That will keep you going for a while! I was surprised, I felt just the right amount of full after. Other diners obviously just don't have the level of cake-eating skill that we do! The chocolate plate is amazing, I couldn't help taking a little nibble on the way home. Sounds and looks like a great afternoon :) the white choc plate is such a nice touch. Definitely the best presented afternoon tea I've had. I think they do a milk chocolate plate in their regular chocolate afternoon tea. Already hacked a bit away to make white chocolate frosting for cupcakes...I have a feeling it'll last me a long time!